Today's post has been requested by a loyal Crumpeteer who you've met before on this blog, Melissa from the Misadventures of a Wannabe Martha. Her point was quite valid - those of us who have been polish-aholics for a while throw certain words and phrases around without explanation; well, what if you're a Newbie and you don't know what those words mean ? 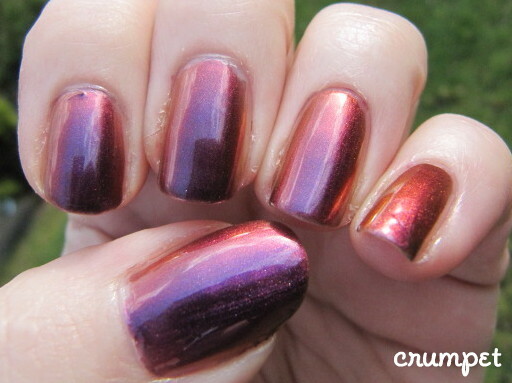 A duochrome polish is a polish that bends between 2 colours. Hold your hand one way, and it will appear one colour, bend your hand another way, and it morphs into another. If you're lucky, you'll see it dancing on the line of that colour change most of the day. Above is Nubar's Peacock Feathers, one of the world's most famous duochromes. 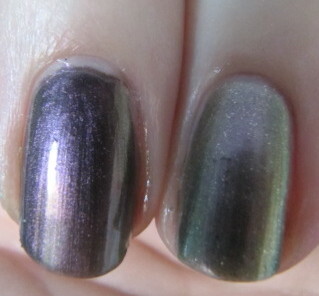 The new China Glaze New Bohemians polishes are also duochrome, but I've heard they don't bend much. The masters of duochrome are Ozotic and HITS. Although I own the HITS Mari Moon polishes, I haven't yet worn them, so you'll need to Google for swatches, but here below are a couple of Ozotics. Finally, some polishes are MULTI-chromes - this means they have more than one colour state - 3 or possibly 4. Holo comes in 2 states - scattered or linear. The latter shows a strong bend, usually in a line down the nail. 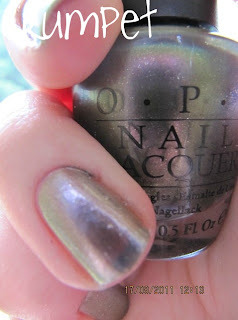 My best example of this is OPI DS Original. 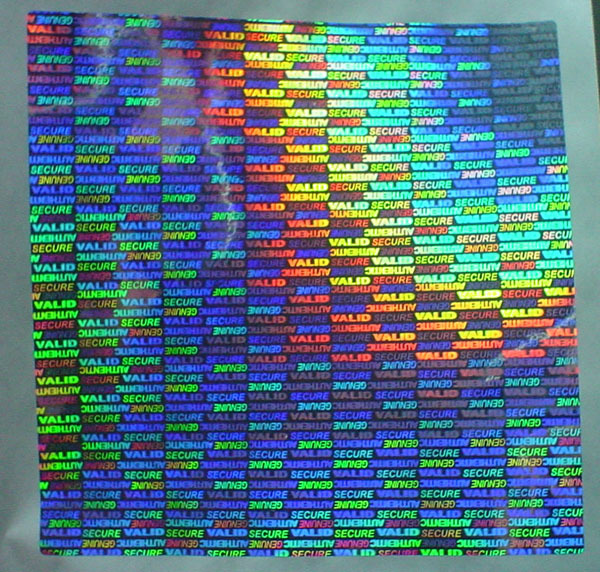 Scattered holos are less "in your face" but pretty nevertheless. Here, the holo twinkles more, or is visible but not in the same way as a linear. 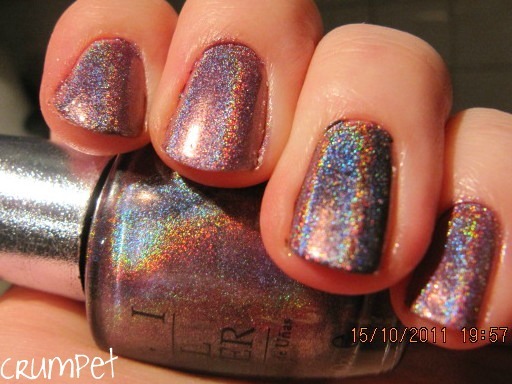 And you can also buy a substance called Spectraflair, which is a powder which when added to ANY polish, will make it a holo. 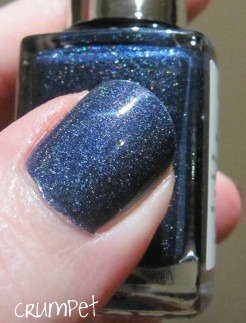 You can also buy lots of holo topcoats on Etsy. What is a lemming ? Well let's start with what lemmings REALLY are, they're little furry creatures that follow each other and then jump off cliffs .. or something similar. In polish terms, a Lemming is a polish you are really really REALLY lusting after and that is high on your Wish List. It can be a noun or a verb - What's your top lemming ? // I am really lemming DS Glamour. I don't know - if you know how it started, please let me know. I've never heard of it in this context outside of the Polish World! So there you go, that was Ask Crumpet, and that's only half of Melissa's questions lol. If you like it, please let me know in your comments, and if there are other questions you would like answered - big or small, polish or non-polish related - please email me at crumpet@the-crumpet.com, I'd love to hear from you. I think this could be a really fun feature, but it can't happen without you. Birthday Nails - Number 1 !!! 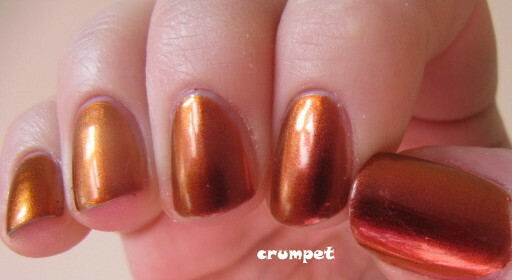 Zoya Daul - Swatch, Review and Stamp! Do You Want To Join The Sat-ART-Day Club? Swatch & Review - KBShimmer - Oh Splat! So, Which Red Is The Best Red? Red Week - Holo-Lot of Dots! Indie Week - Pam's Girly Bits - Mother May I?